Continuously monitors face velocity air flow of fume hood. If the hood face velocity falls below set point, an audible alarm sounds, mute button is intialized. 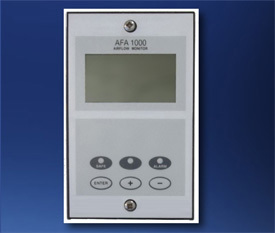 The AFA 1000/1/Mk2 model is a flush mounted air flow monitor for Fume Hoods. It features a back lit display that displays the air flow velocity or Air Flow status. Minihelic gauge monitors the pressure accross a HEPA filter. 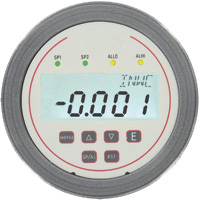 Digihelic gauge allows selcetion of pressure, velocity , or volumetric flow operation, with easy programing. The Airflow Monitor high performance velocity alarm provides the industry with a cost-effective, accurate and reliable velocity alarm to help ensure a safe operating environment for laboratory personnel. 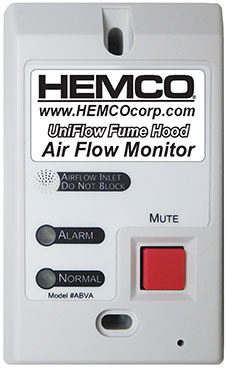 The Airflow Monitor is suited for use on all types of fume hoods. The Airflow Monitor is installed directly onto the exterior of the device which it is monitoring – fume hood or BSC. For fume hood applications, a small probe is provided, which is installed on the interior sidewall of the hood. This probe is connected to the Airflow Monitor using very small tubing (1⁄4” O.D. ; also provided). For BSC applications, a duct static pressure probe is used in lieu of the sidewall probe and is installed into the exhaust duct serving the BSC. The Airflow Monitor measures airflow by drawing an extremely small amount air from the room through the front reference port, through the internal air flow sensor and exits through the sidewall probe or static pressure probe. The airflow measured by the sensor is proportional to the fume hood face velocity and the BSC duct static pressure. 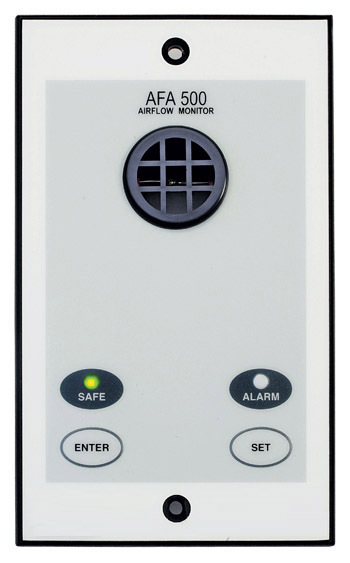 If at any time the velocity drops below the calibrated alarm set point, the Airflow Monitor goes into full alarm mode (audible alarm sounds, mute button is initialized, red LED flashes and the alarm relay changes state). The alarm may be silenced by pressing the mute button. However, the red LED and relay remain the same until the alarm condition has been cleared. 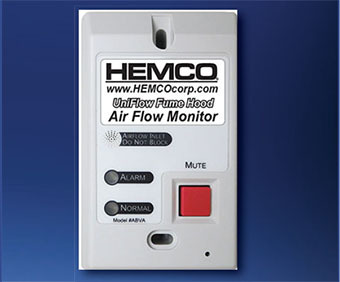 The Airflow Monitor Velocity Alarm measures airflow velocity using an ultra-sensitive micro-bridge airflow sensor coupled with a high-resolution (24-bit) A/D converter. The resulting digital airflow measurement is extremely accurate, precise and repeatable. 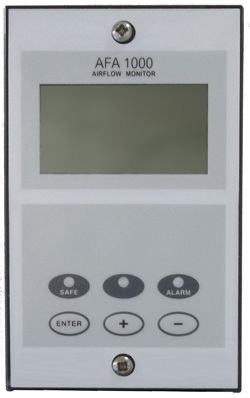 The alarm set point is programmed using a simple one-step operation which calibrates and stores data into the microprocessor’s non-volatile memory.The microprocessor continually compares the real time measured airflow to the programmed alarm set point. When the measured airflow is greater than the calibrated alarm set point, the green LED is illuminated to indicate normal operating conditions. 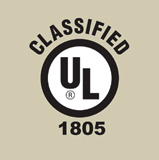 When the measured airflow is less than or equal to the calibrated alarm set point, the unit goes into alarm mode alerting the lab occupants of a potentially unsafe condition. 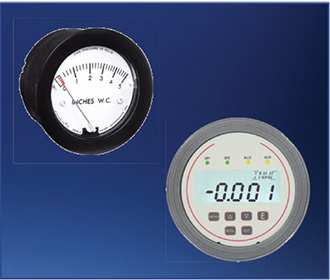 Air Flow monitor designed for applications where airflow velocity indication is not required. 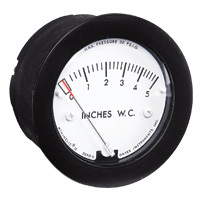 The 51409 is available with either a built in or remote unique air flow sensor that is used to measure face velocities or duct velocities and is available in fully flush or semi flush mount. • Red LED flashing will be displayed when the sash is raised above the maximum safe working opening, Red LED (not flashing) indicates low airflow an audible alarm sounds. • Night set back, when the night set back is activated the audible alarm will be muted and the Green LED will flash on/off. • Unit is mounted on the face of the fume hood side wall at a convenient viewing height. • Power Supply - Low voltage DC power supply 15V DC. Monitor is supplied complete with a plug in type power supply for connection to a single gang socket. The main supply should be fused 3A. • Sensor Cable- standard length of remote type sensor cable is 2M, a 5M version is also available. Custom sizes can be supplied. The 51410 model is a flush mounted air flow monitor for Fume Hoods. It features a back lit display which displays the air flow velocity or air flow status. When the alarm is activated, the display will alternate between the air flow velocity and the alarm condition. or on the filter housing. units. Gauge is 3” dia.